(L to R) Richard M. Joel, Yeshiva University President; Doris Travis, Stern College board member and dinner chair; Karen Bacon, dean of Stern College; and Billy Ivry, Stern College board member. 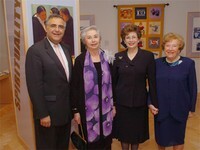 Oct 22, 2004 — Yeshiva University President Richard M. Joel and Chancellor Norman Lamm joined leaders of the university’s Board of Trustees and Stern College for Women’s Board of Directors at an October 21 gala dinner at the Yeshiva University Museum to celebrate the opening of “Five Decades. One Dream,” a museum exhibit that traces Stern College’s history through photos and artifacts. The exhibit groups items around the ideas of study, spirituality, social responsibility, and campus life. A timeline explores the essence of a Stern education featuring events during its history and pairing them with milestones in Jewish life, the nation’s history, and international events. In addition, a video, “Portraits of Promise,” helps bring the Stern experience to life through testimonials by current students, accomplished alumnae, faculty, and college supporters. The dinner was chaired by Stern College board member Doris Travis. “Five Decades. One Dream” runs through January 9, 2005 at Yeshiva University Museum, 15 W. 16th Street, between Fifth and Sixth Avenues, in The Center for Jewish History.